TOKYO (Reuters) - Security in the South China Sea, claimed almost wholly by China, impacts Japan's interests and could warrant a rethink of military patrol aircraft deployments, the defense minister said after a U.S. Navy officer said Washington would welcome a Japanese presence in the region. Regular patrols by Japanese aircraft only reach into the East China Sea, where Japan and China are embroiled in a sovereignty dispute over a group of islands. Extending flights into the South China Sea would almost certainly increase tension between the world's second- and third-largest economies. "We currently do not patrol there or have a plan to do so, but we are deepening our cooperation with the U.S. and the situation in the South China Sea has an impact on our national security, and we are aware that we will need to consider our response," Defence Minister Gen Nakatani told reporters on Tuesday. 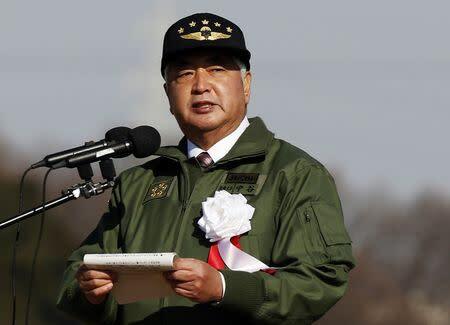 Nakatani's remarks came in response to an interview published by Reuters in which Robert Thomas, commander of the U.S. Seventh Fleet, said Japanese surveillance flights in the South China Sea would help keep tabs on a growing fleet of Chinese vessels overwhelming the surveillance capacity of Southeast Asian nations. China responded to Thomas's comments by warning Japan not to "create tension". China, the Philippines, Vietnam, Taiwan, Malaysia and Brunei have competing territorial claims in the South China Sea. China has outlined the scope of its claim with reference to a so-called nine-dash line on its maps that encompasses 90 percent of the waters. While Japan has no claims in the region, it provides 10 per cent of the global fisheries catch and ships crossing it carry $5 trillion a year in cargo, a large portion to and from Japan. Thomas's comments show Pentagon support for a key element of Japan Prime Minister Shinzo Abe's push for a more active military role Asia, and come as the U.S. and Japan negotiate new bilateral security guidelines expected to give Japan a bigger role in their alliance, 70 years after the end of World War Two.